BEYOND THRESHOLD W/DEVIL YOU KNOW and BUTCHER BABIES!!! 04/24/2014 @ The Q&Z Expo Center in Ringle, WI!!! JUST ANNOUNCED!! Thursday April 24th!! Scary Terry’s Saturday Nightmare brings you a special event!! 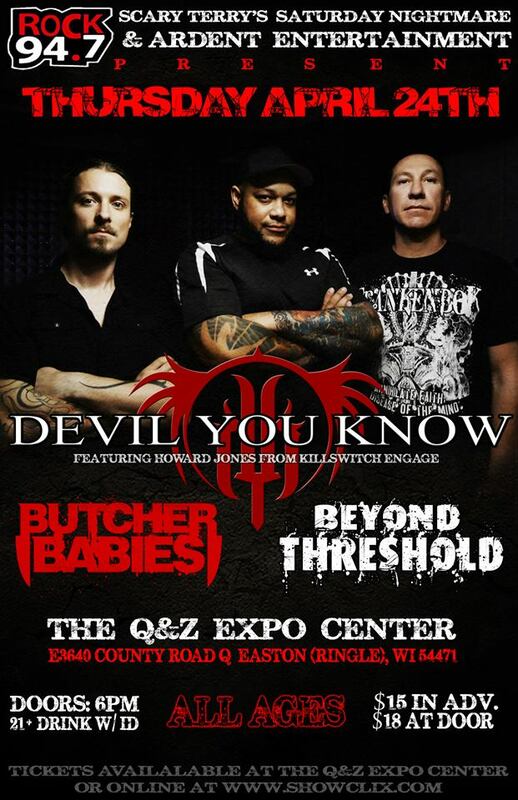 Devil You Know featuring: Howard Jones from Killswitch Engage comes to Ringle, WI with Butcher Babies and Beyond Threshold!! Presented by Ardent Entertainment, LLC and Rock 94.7 at The Q & Z Expo Center – Entertainment Complex in Ringle, WI!! ✓ Get ready METAL fans for an EPIC show! ✓ Tickets available at The Q and Z Expo Box Office!